A view of the International Criminal Court (ICC) premises. 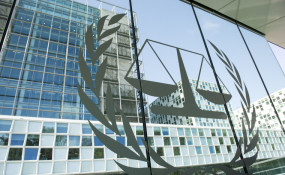 In a statement, the Court, which is based in The Hague, the Netherlands, detailed an extensive list of some of his alleged crimes, including murder, torture, persecution, mutilation, deportation or forcible transfer, enforced disappearance and "other inhumane acts." Mr Ngaïssona was arrested on 12 December last year in France, on a warrant for crimes allegedly committed in CAR during 2013 and 2014. In a press release, the ICC said that the date of his initial appearance before the court will be announced "soon." Speaking on Wednesday to UN News, ICC spokesperson Fadi El Abdallah outlined the next steps in the case: "The Pre-Trial Chamber Two of the ICC found reasonable grounds to believe that Mr Ngaïssona is liable for these charges", he said, adding that the pre-trial hearing would "confirm the identity of the suspect, ensure that he understands the charges and confirms the language in which the proceedings should be conducted for his understanding". He said it would also set a date "to begin the confirmation of charges hearing, which is a pre-trial hearing allowing the judges to decide whether or not the case should move to a trial."